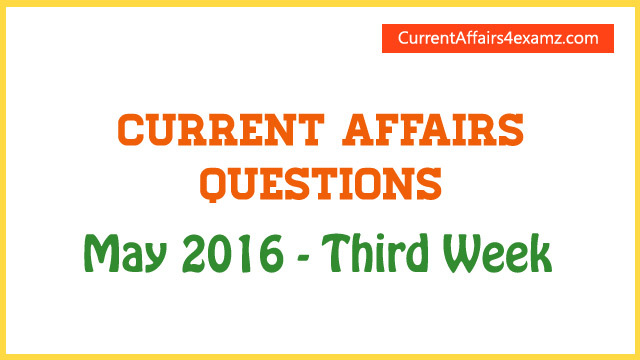 Hi Aspirants, Here are the Important Current Affairs Questions from the Third week of May 2016 useful for all upcoming competitive exams. 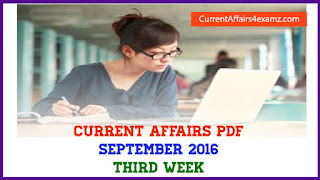 We have covered all the important happenings of the week keeping in mind all the upcoming exams like Civil Services Exam 2016, SBI PO 2016, SBI Clerk 2016, SSC CGL 2016 Tier-1, SSC Stenographer Exam, SSC CHSL 2016 etc. You can download the PDF from the below link. Note: She will succeed Ajay Kumar Singh, the Lieutenant Governor of Andaman and Nicobar Islands, who was holding the additional charge of Puducherry since July 2014. Note: This was Denmark’s first ever win in the international tournament. Note: He is the second youngest BCCI chief. Fatehsinghrao Gaekwad in 1963 became the youngest BCCI President at the age of 33. Thakur succeeds Shashank Manohar who stepped down from the position to take up the ICC chief's job. Aspirants please note - Anurag Thakur is also a BJP MP in Lok Sabha from Himachal Pradesh's Hamirpur district. Note: In the final played at the Kunshan Sports Centre Gymnasium in Beijing, the host country defeated South Korea 3-1. India won the bronze of the Uber Cup tournament after they suffered a 0-3 defeat at the hands of defending champions China in the semifinals. Note: In the final played at the Indira Gandhi Athletic Stadium in Guwahati, Bagan defated Aizwal FC 5-0. Note: The theme was Know Your Numbers. 15) SBI on 17 May 2016 informed the Bombay Stock Exchange (BSE) that it is seeking in-principle sanction of the Union Government to enter into negotiation with its 5 subsidiaries and Bharatiya Mahila Bank for acquisition. Name the 5 subsidiaries of SBI? Note: This year, WTISD focused on the theme ICT entrepreneurship for social impact. Note: The theme for the year was Families, healthy lives and sustainable future. Note: It is a first-of-its-kind dedicated platform for start-ups to fulfill all their banking needs. Note: He is the Former Finance Secretary. 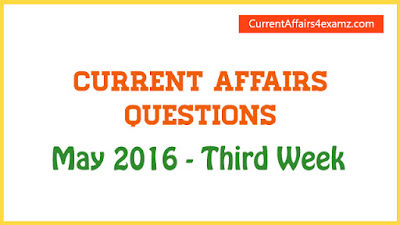 Prime Minister Narendra Modi and Arvind Panagariya are the Chairperson and the Vice Chairperson of the institution. mitabh Kant is the Chief Executive Officer of the NITI Aayog. Note: The theme for the year 2016 is Mainstreaming Biodiversity; Sustaining People and their Livelihoods.